As many of you know, I have a large old lemon tree in my backyard, and always on the lookout for things to do with lemons. Lots of lemons. You can only drink so much lemonade. So I decided to try making preserved lemons, which are a traditional food in North Africa (think a Moroccan tagine)... and when you have a giant jar of them in your refrigerator (not small expensive jars from a gourmet store) you start experimenting. And now I get cravings for them, even though I have not tried making tagine yet! Traditionally, to make preserved lemons, you "almost" quarter the lemons, then stuff with salt, then stuff the lemons in a jar. This seems like a lot of bother. Then I stumbled on this recipe where you just quarter the lemons... Eureka! Actually, the recipe was for Meyer Lemons, but works just fine on Eureka lemons. Next I am going to try with limes (and do a smaller batch). Here is my short version of the recipe, click through the link for more details. Mix lemon quarters and salt in a large bowl. Let sit at room temperature about 1 hour. 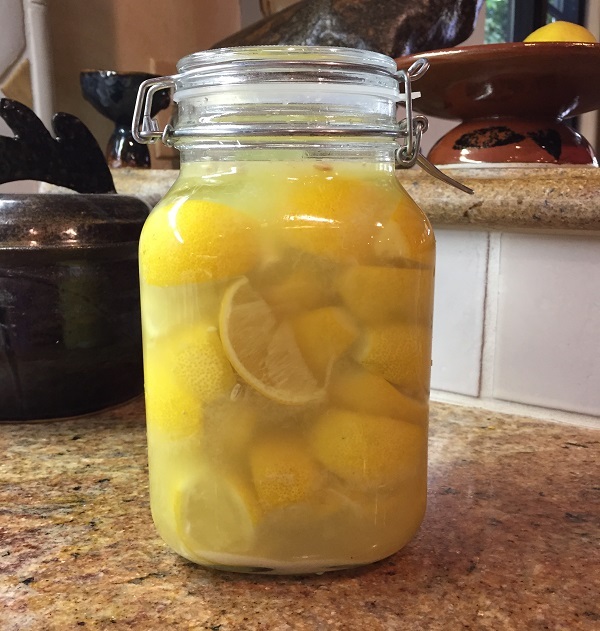 Tightly pack lemon quarters into a large 2 quart jar. Use lemon juice to just cover (note – I use pickle weights to help hold down the lemons). Let the jar sit at room temperature for about 7 days until lemon rinds are glossy and look translucent all the way through, then refrigerate. They will be good for many months, at about a year they start getting mushy. So, what do you do with them? The first key is to rinse off each piece when you are ready to use it, and remove the pulp... you just use the lemon rind (the pulp is pretty mushy and super salty, although there are some recipes that call for it), and usually dice into small pieces. They have a bright, briny pop, and use them like you might use capers or olives. You can add to most any pasta or grain salad, I also like them with green salads that have fish in them. I sometimes throw them into the Chickpea and Vegetable Saute. They go great on roasted vegetables. I haven't tried this recipe yet, but it looks good: Roasted Carrots with Lemon. Roast the garlic: Preheat oven to 350F (can do in toaster oven). Cut off the top of the garlic. Set the garlic in the center of a square of foil, drizzle with olive oil so that oil runs into the cloves. Bunch (scrunch) the foil around the garlic head, leaving a bit of an opening then bake for 35 – 45 minutes until cloves are nice and soft. Let cool. Mix the remaining ingredients in a small bowl with a wooden spoon. Slip the garlic cloves out of the skin and add to the bowl. Mash them a bit on the edge of the bowl (you may or may not want to add the whole head depending on how big it is) then stir together. Refrigerate the mixture for at least an hour to let the flavors meld, but let sit at room temperature for 20 minutes or so before serving so that is spreads more easily. Serve on warm bread, crackers, or crudité. And last, if you want to go the trendy route with kale and a home-fermented food, try this salad, which was inspired by my favorite salad at our local chop house, Stake. While they do have good steaks, we are much more likely to go there and just have a flatbread and salad, or a roasted vegetable outside on the balcony... along with a nice bottle of wine. ¼ of an avocado (optional) – diced. Roast almonds: place on foil on a pan and toast in a toaster oven until light brown. Alternatively, roast in a small skillet over medium heat, tossing frequently. Or start with roasted almonds. Massage kale leaves with a tablespoon or so of olive oil and a sprinkle of salt. Let sit while you chop the remaining vegetables. Add the cabbage, preserved lemon, cheese and optional ingredients. Add the almonds (they should be slightly cooled). Toss. Add the lemon juice and a good grind of pepper, toss some more. If the salad looks dry, add another bit of olive oil. Taste to determine if more salt is needed (the preserved lemon and feta are pretty salty, so more salt may not be needed). Serve in a handmade bowl.